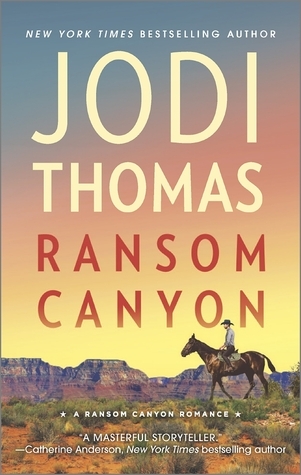 My take: Ransom Canyon is the first book in Jodi Thomas’s new series. I enjoyed meeting the people who live in and around Crossroads, Texas. After maintaining an almost aloof relationship for years Staten Kirkland and Quin O’Grady are faced with a life-changing decision. Newcomer Yancy Grey is hoping for a second chance at life when he falls into a job that surprises him even more than the people who will come to rely on him. There’s a budding friendship between two teens that may become more over the course of the next few years. That will have to wait if Lauren’s father has anything to say about it. He’s the sheriff, after all. I loved the way Jodi Thomas wove her story with love, drama and humor. It’s why I enjoy her books so much. I can’t wait to read the next book in the Ransom Canyon series. Recommended to fans of the author and contemporary, small town romance. After reading the author’s guest post the other day, I really want to try this series. I really must read something by this author…this one sounds like a great setting with wonderful characters. Thanks! My dad loved westerns. I don’t think I’ve read more than one or two. I should try another one shouldn’t I? I think I won a book of hers from your blog years ago and I still haven’t read it 😦 Will I ever have enough time to read all the good books?